Click here to tell your browser to print these cards. These are designed to be printed in landscape mode on 4x6 index cards. To save paper, we recommend using your computer's print preview until you get your printer settings correct. 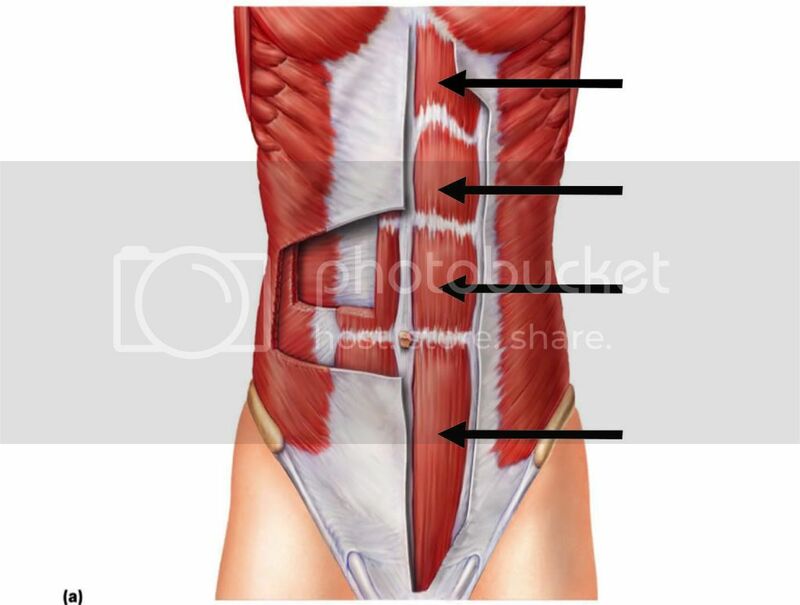 O: Lumbar fascia, lower 6 ribs and iliac crest. I: Linea alba and pubic bone. 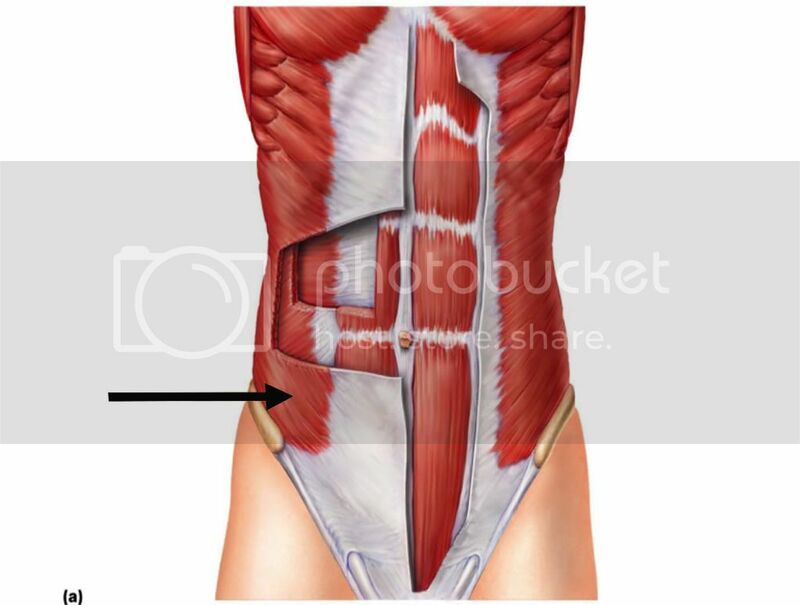 A: Compresses abdominal wall; stabilizes spine. Consists of Semispinalis and a number of short muscles that extend from one vertebrae to the next. A: Stabilize spine; synergists in extension and rotation of the spine. 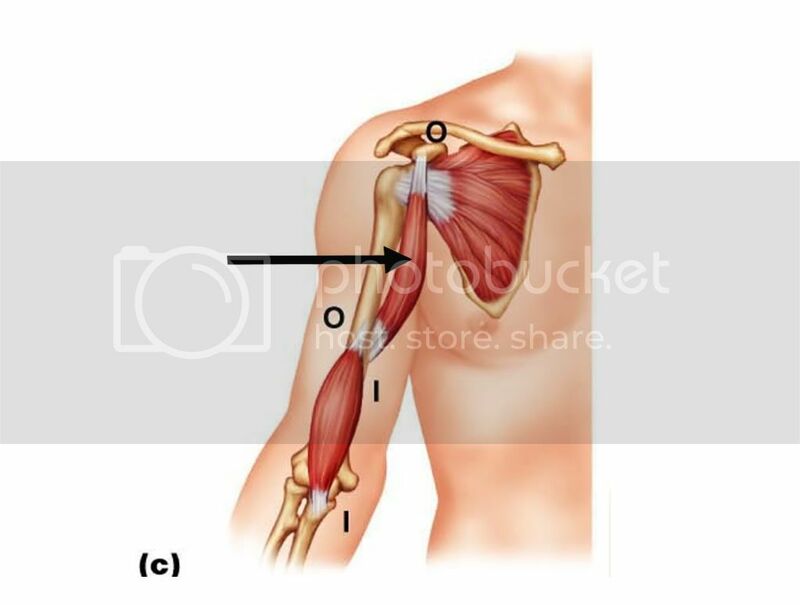 O: Manubrium and medial portion of clavicle. I: Mastoid process and Occipital bone. 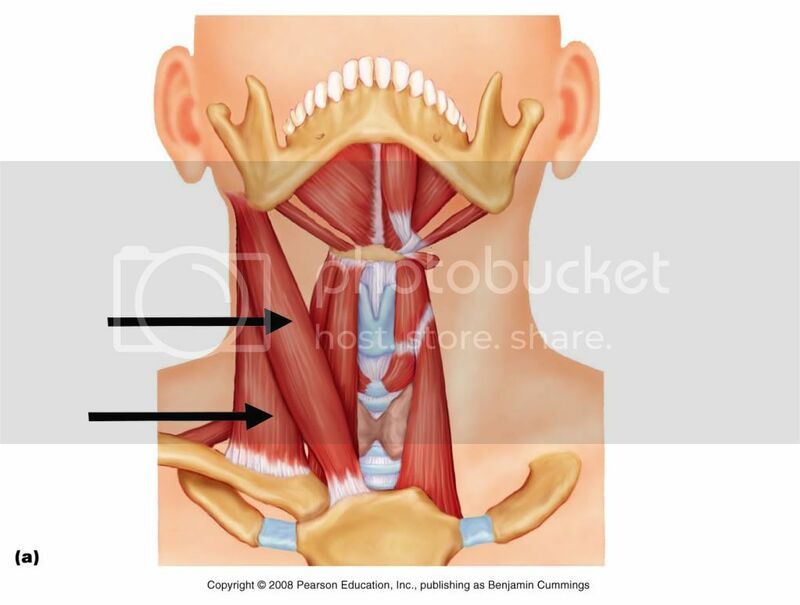 A: Bilatterally - Neck flexion. Unilaterally - Rotation towards opposite side; lateral flexion on same side. I: Capitis - Mastoid process and occipital bone. Cervicis - Transverse process of C2-C4. 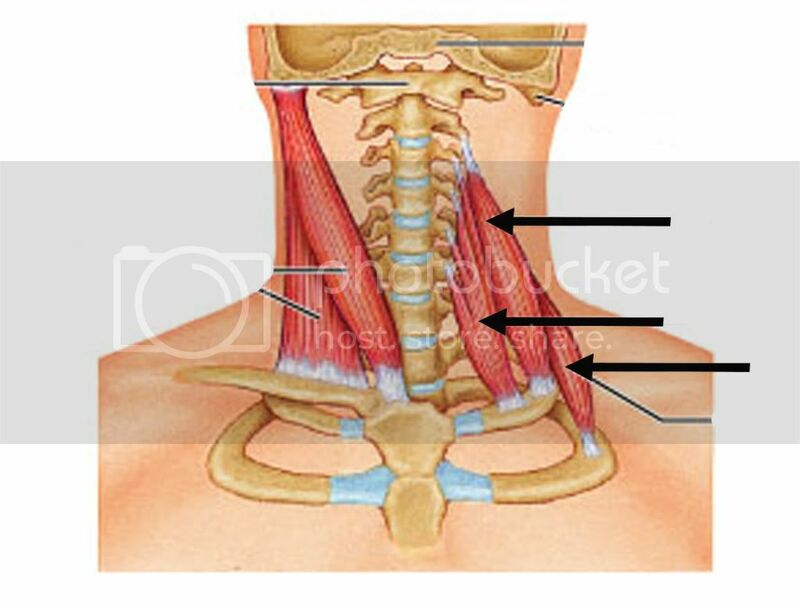 A: Bilaterally - Neck extension and hyperextension. 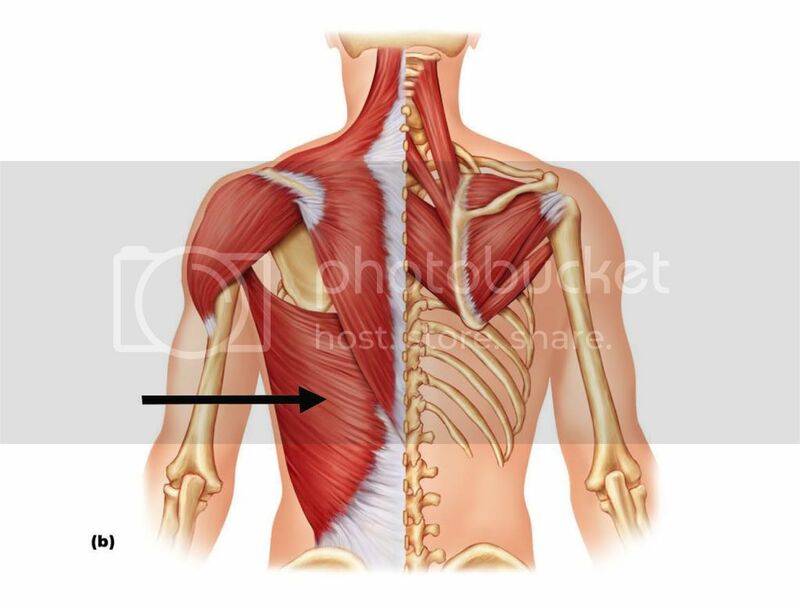 Unilaterally - Lateral flexion and rotation to same shoulder. A: Bilaterally - extension and hyperextension of vertebral column. 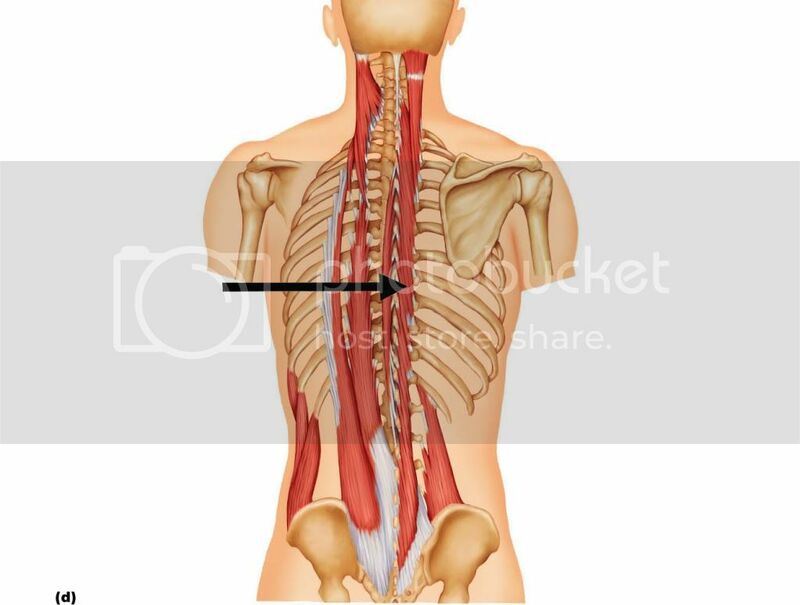 Unilaterally - Rotation of vertebral column to opposite side. O: Transverse processes of cervical vertebrae. I: Ribs 1 and 2. A: Elevates first two ribs. O: Pubic crest and pubic symphysis. 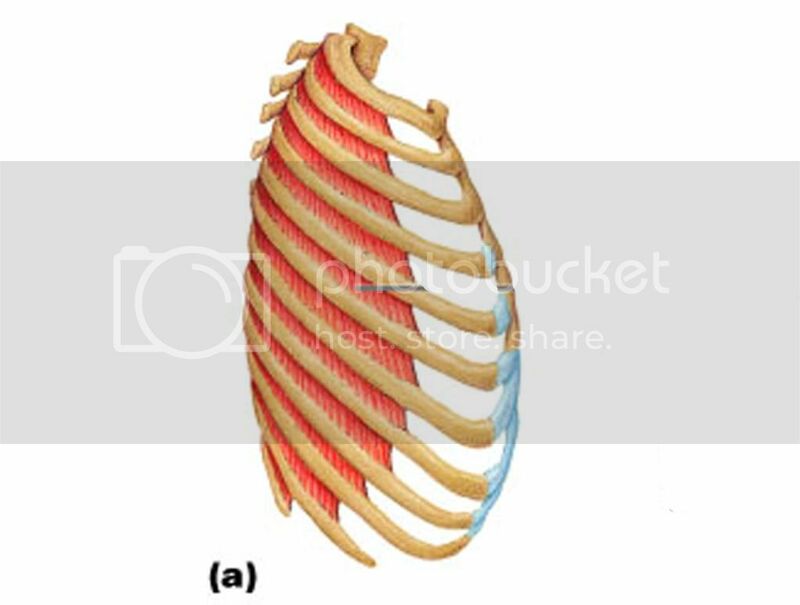 I: Xiphoid process and costal cartilages of ribs 5-7. A: Bilaterally - Prime mover of spine flexion. 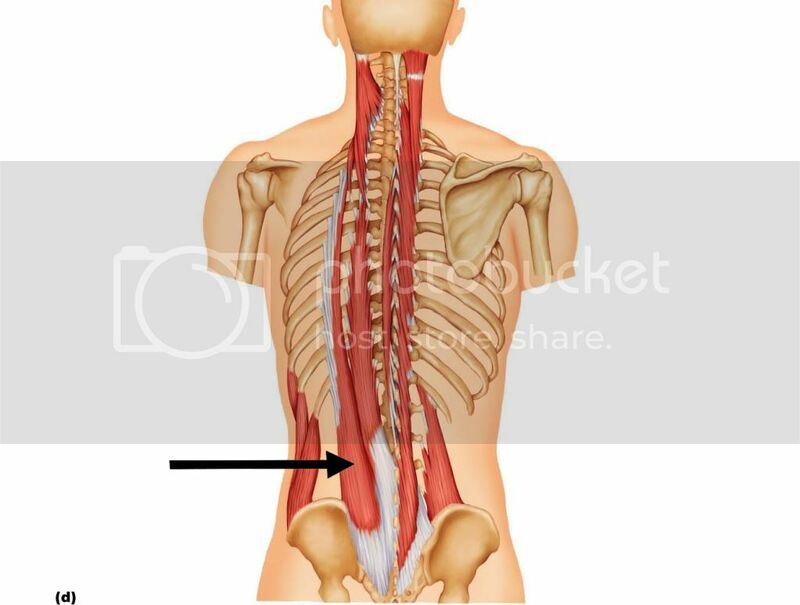 Stabilizes spine by compressing abdominal wall to create rigid column; stabilizes pelvis while walking. 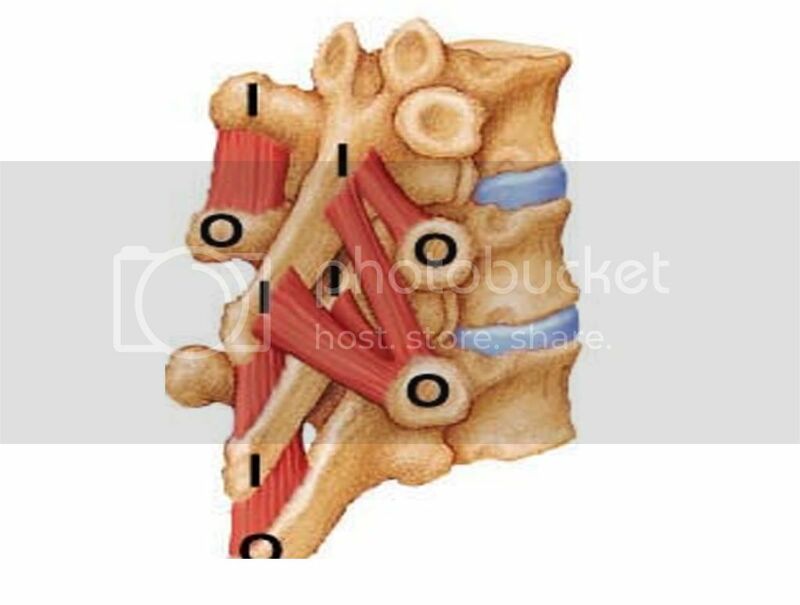 I: Transverse processes of Lumbar Vertebrae and 12th Rib. A: Bilaterally - Extension and hyperextension of lumbar spine. Maintains spinal curvature; assists in forced inspiration. Unilaterally - Lateral flexion of vertebral column. 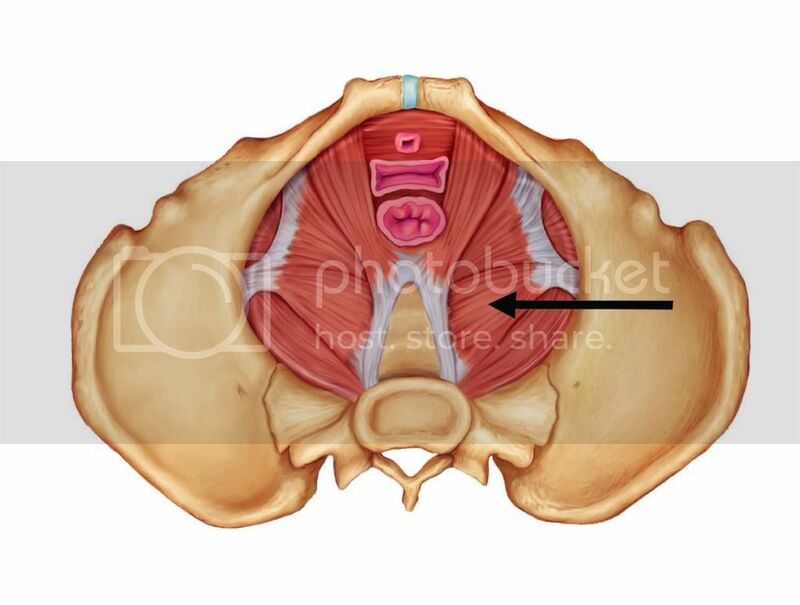 O: Iliac crest and lumbar fascia. I: Linea alba and lower 3 ribs. 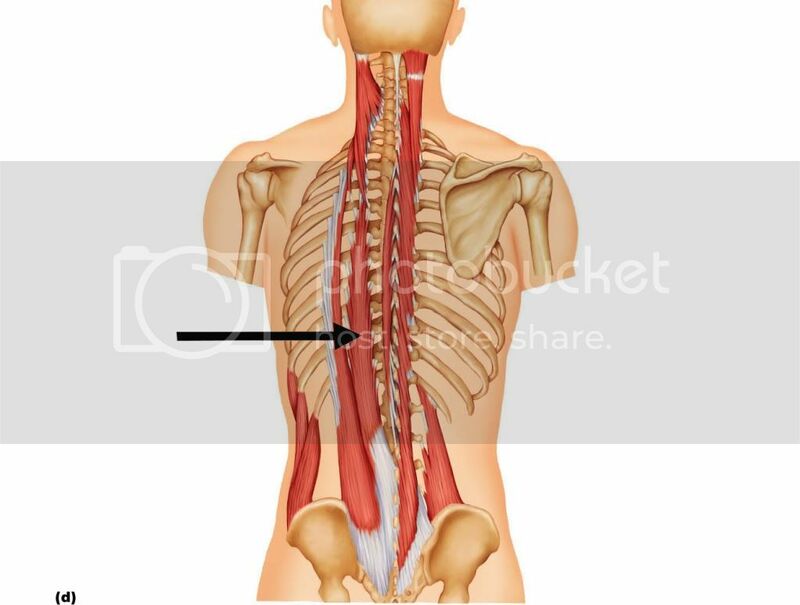 A: Bilaterally - Spine flexion. Unilaterally - Lateral flexion and rotation of spine to same side. Fibre Direction: Down and back. A: Assists with active or forced expiration. I: Anterior iliac crest and linea alba. Unilaterally - Rotation and lateral flexion of spine to same side. Fibre Direction: Down and forward. A: Lifts rib cage for assisting in inspiration. 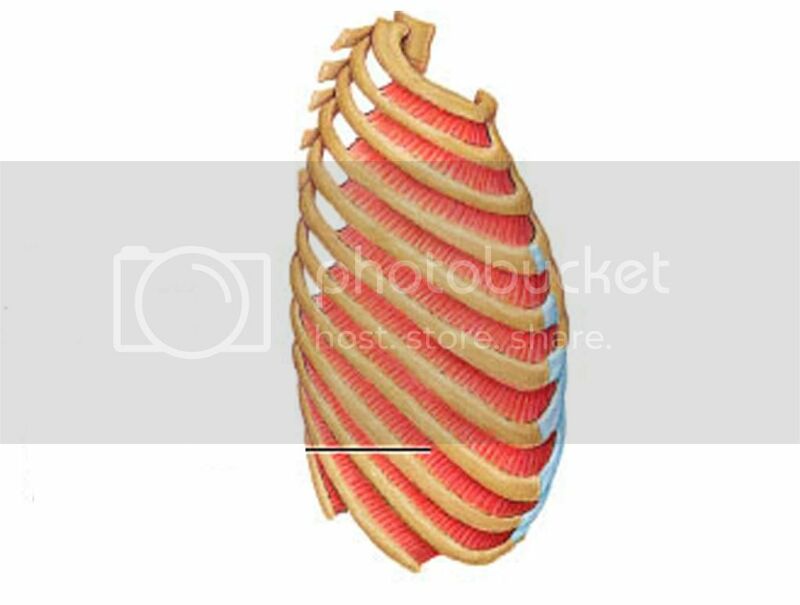 O: Inferior surface of rib cage and sternum, costal cartilage of last 6 ribs and inferior lumbar vertebrae. A: Prime mover of inspiration. A: Provides support for pelvic viscera and helps regulate passage for urine and feces. A: Elevation of ribs and depression of scapula. 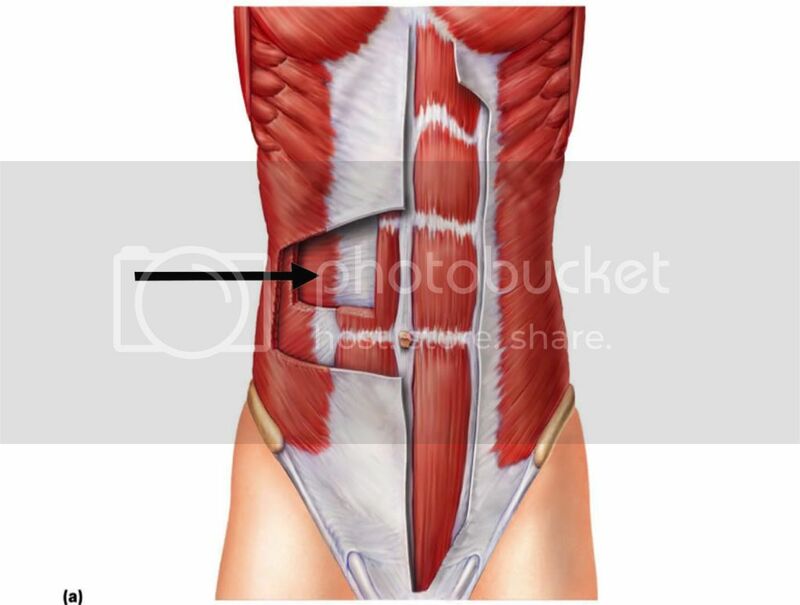 O: Muscle slips of ribs 1-8. 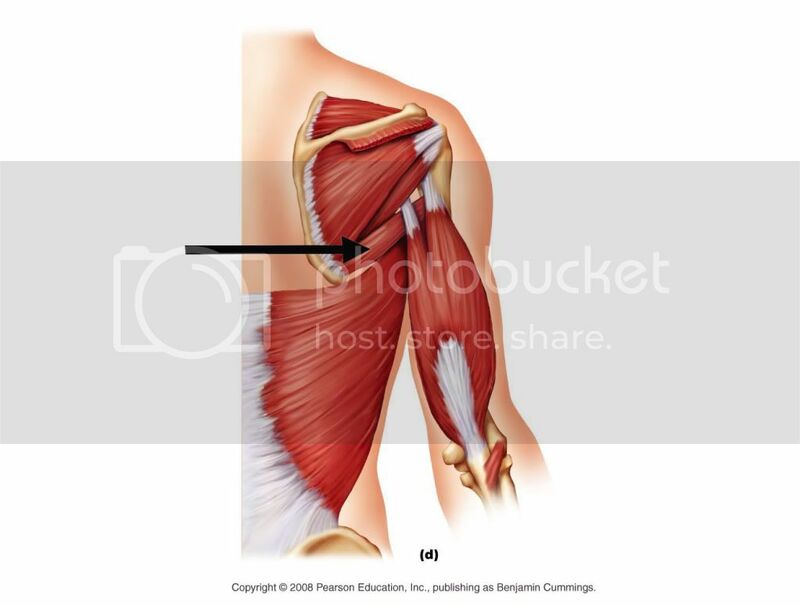 I: Medial border of scapula (deep to scapula). A: Protraction of scapula (PM); holds scapula against thoracic wall; upward rotation of scapula; assists in shoulder movements (abduction and horizontal abduction). 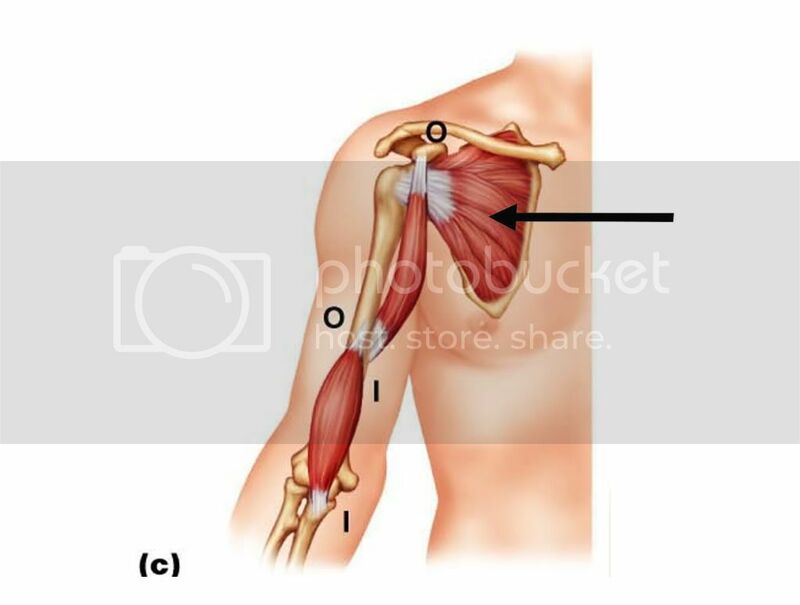 O: Costal cartilage of rib 1. I: Inferior surface of clavicle. 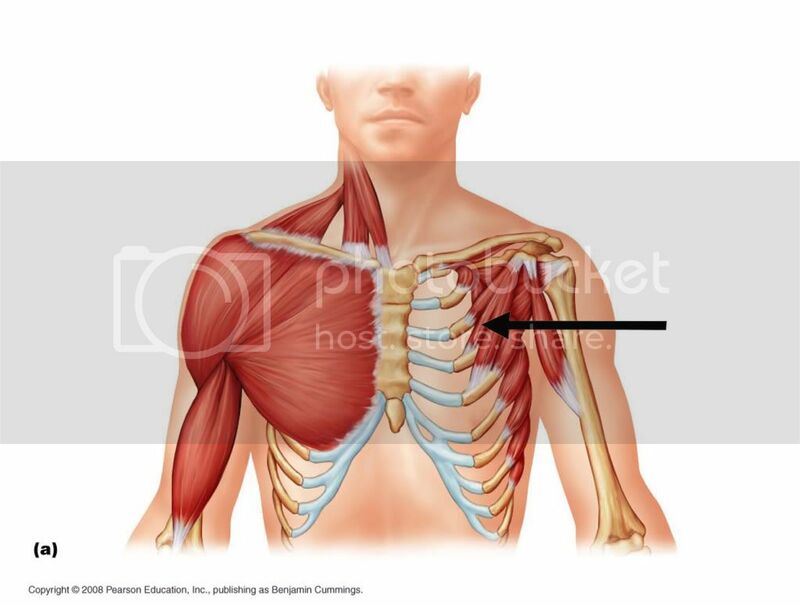 A: Stabilizes and depresses the pectoral girdle. O: Transverse processes of C1-C4. I: Medial border of scapula, superior to spine of scapula. 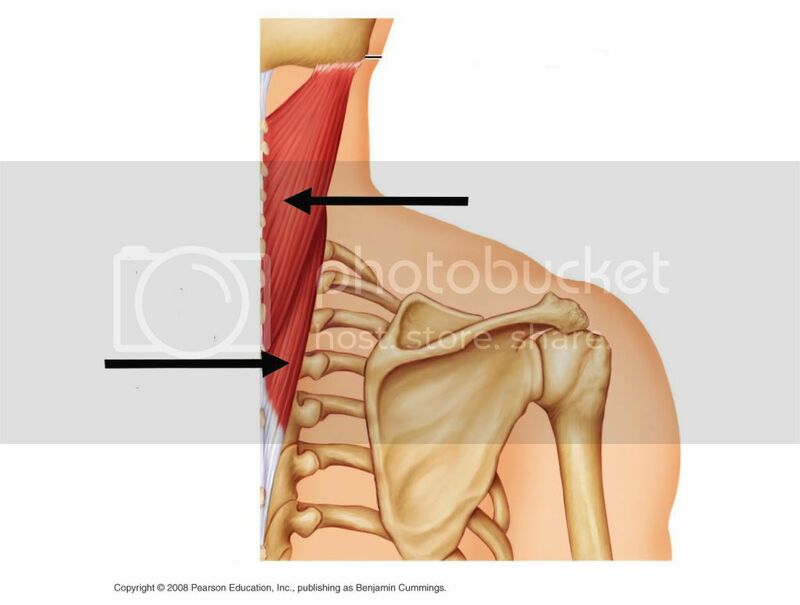 A: Elevation and retraction (synergist to Trapezius) and downward rotation of scapula. O: Spinous processes of C7-T1. 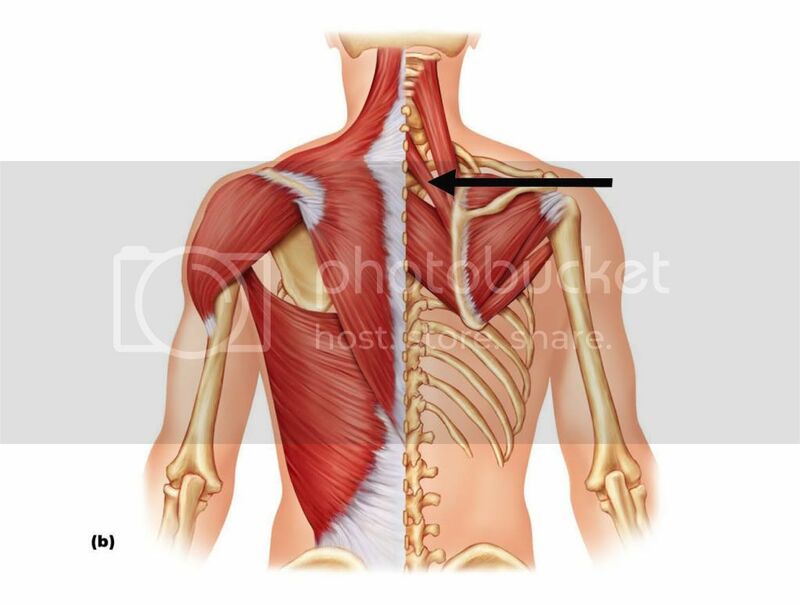 I: Medial border of scapula (inferior to spine of scapula). A: Retraction, elevation, stabilization, and downward rotation of scapula. O: Spinous processes of T2-T5. O: Occipital bone, ligamentum nuchae and spines of C7-T12. I: Spine of scapula, acromion process and lateral 1/3 of clavicle. 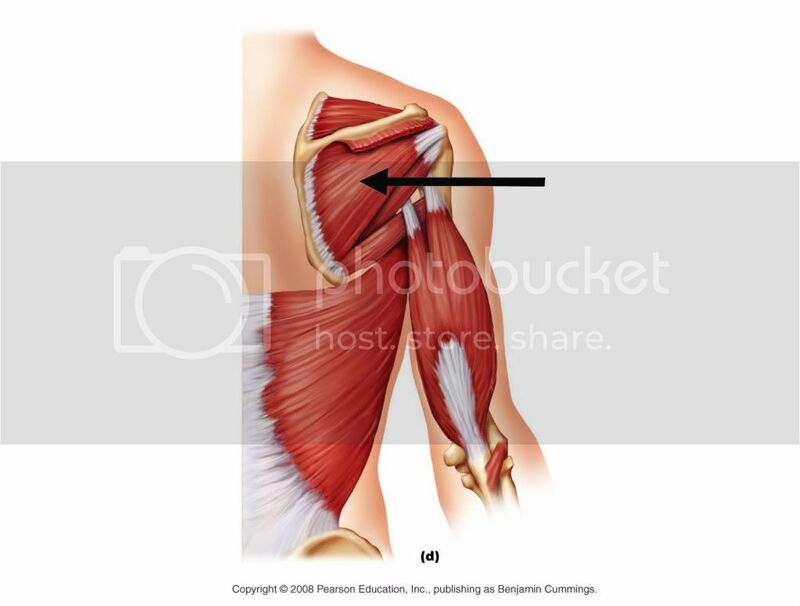 A: Superior fibres - Elevation of scapula. Middle fibres - Retration of scapula. Inferior fibres - Depression of scapula; lowers shoulder. O: Sternal end of clavicle, sternum and costal cartilages of ribs 1-6. I: Greater tubercule of humerus. 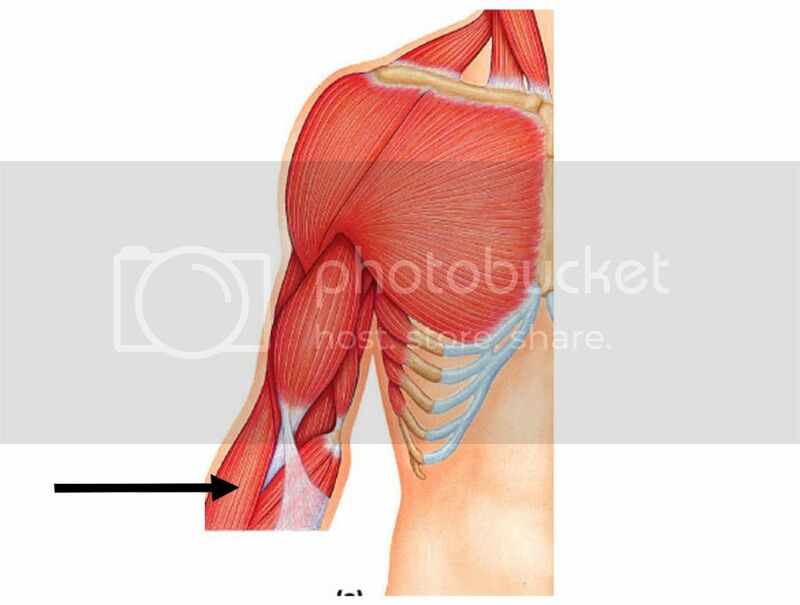 A: Flexion (PM), adduction and medial rotation of humerus. O: Spine of scapula, acromion process and lateral 1/3 of clavicle. I: Deltoid tuberosity of humerus. 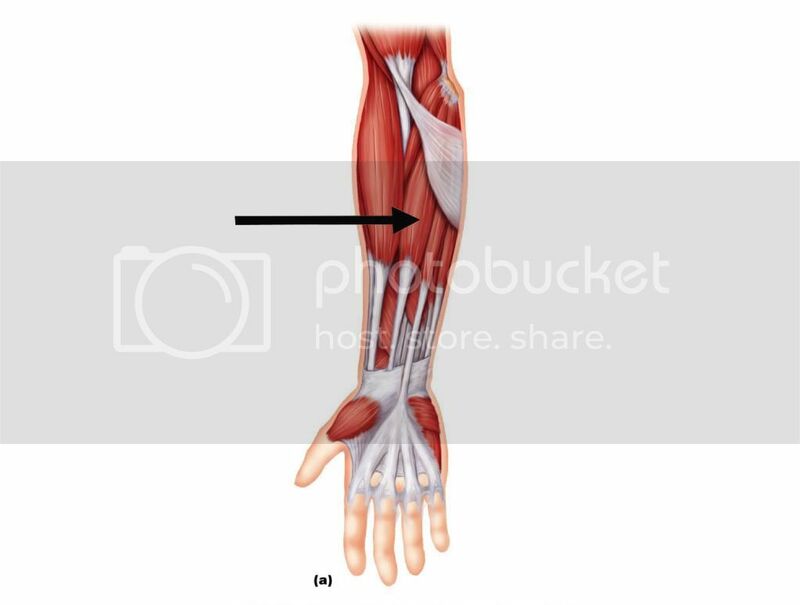 A: All fibres - Arm abduction (PM). 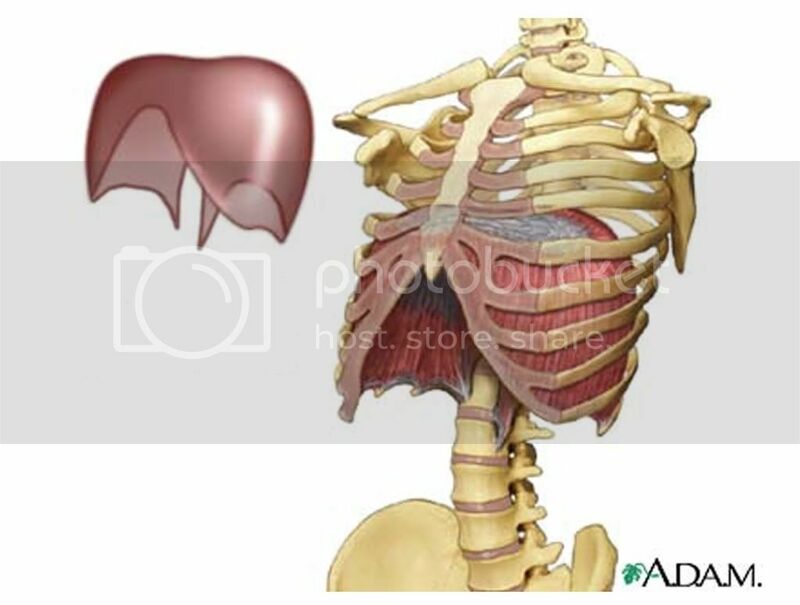 Antagonist of Pectoralis Major and Latissimus Doris. Anterior fibres - Flexion and medial rotation of arm. 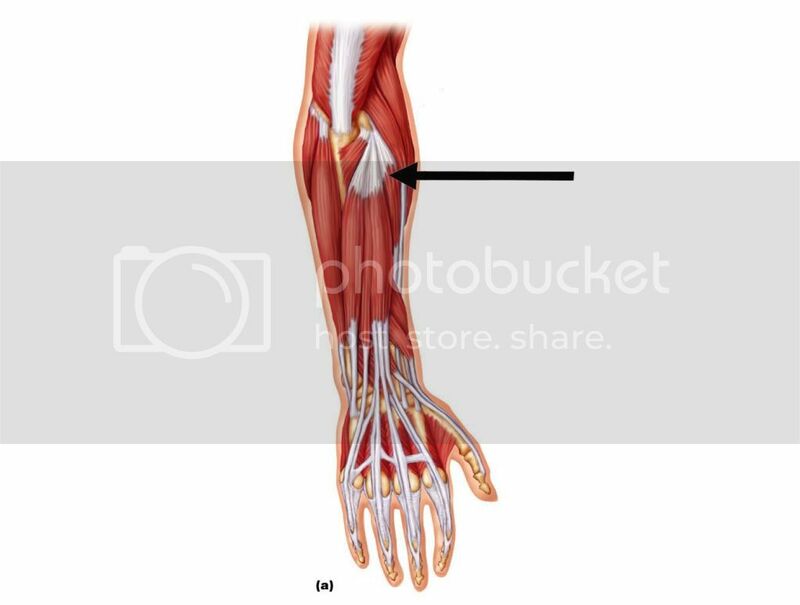 Posterior fibres - Extenstion and lateral rotation of arm. 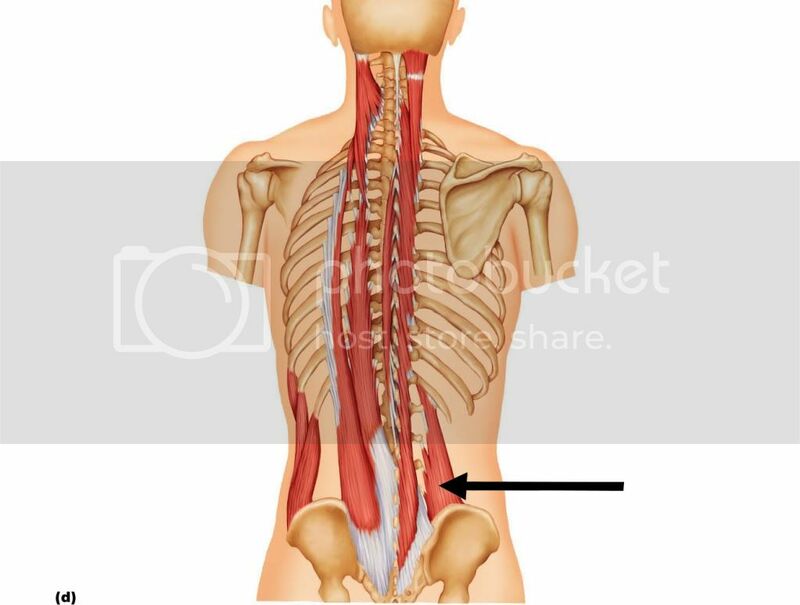 O: Lumbodorsal fascia, spinous processes of inferior 6 thoracic vertebrae, lumbar vertebrae, lower 3-4 ribs and iliac crest. I: Intertubecular groove of humerus. A: Arm extension (PM), adduction and medial rotation. I: Lesser tubercule of humerus. A: Medial rotation and adduction of arm; stabilizes shoulder joint. 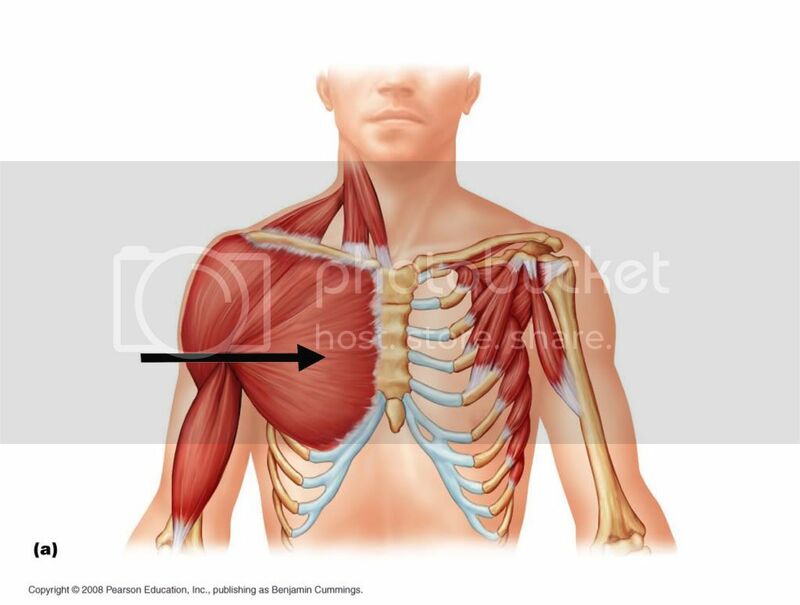 I: Greater tubercle of humerus. 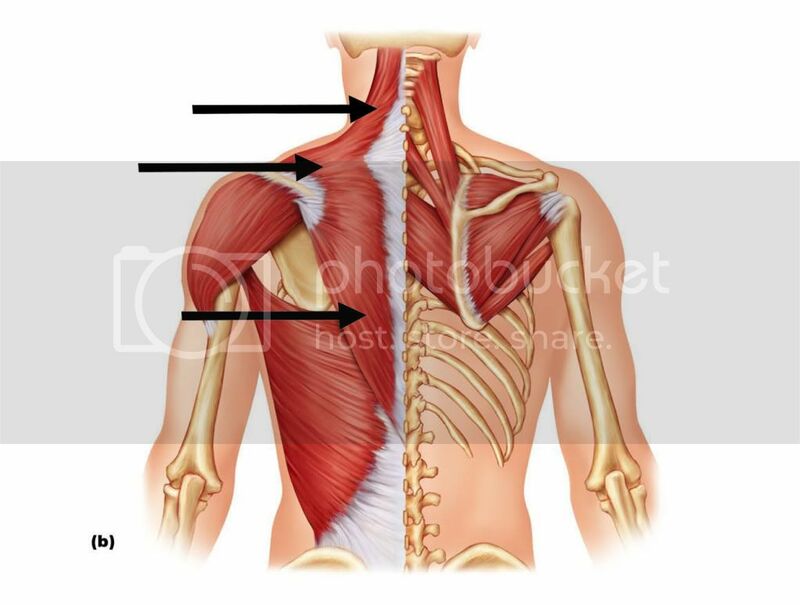 A: Initiates and assists Deltoid in abduction; stabilizes shoulder joint. A: Lateral rotation of humerus; stabilizes shoulder joint. O: Lateral border of dorsal scapular surface. A: Adduction and lateral rotation of arm; stabilizes shoulder joint. O: Posterior surface of scapula at inferior angle. 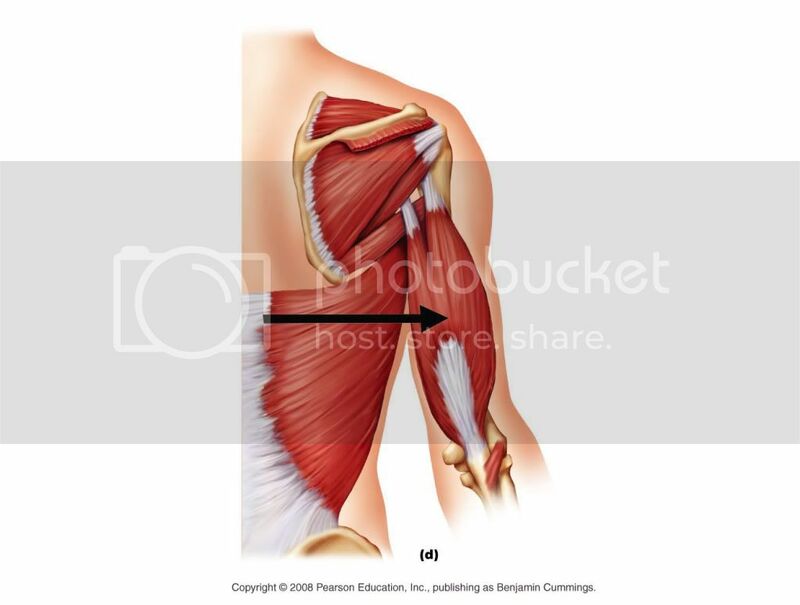 A: Extension, medial rotation and adduction of arm; synergist to Latissimus Dorsi. I: Medial surface of humerus. 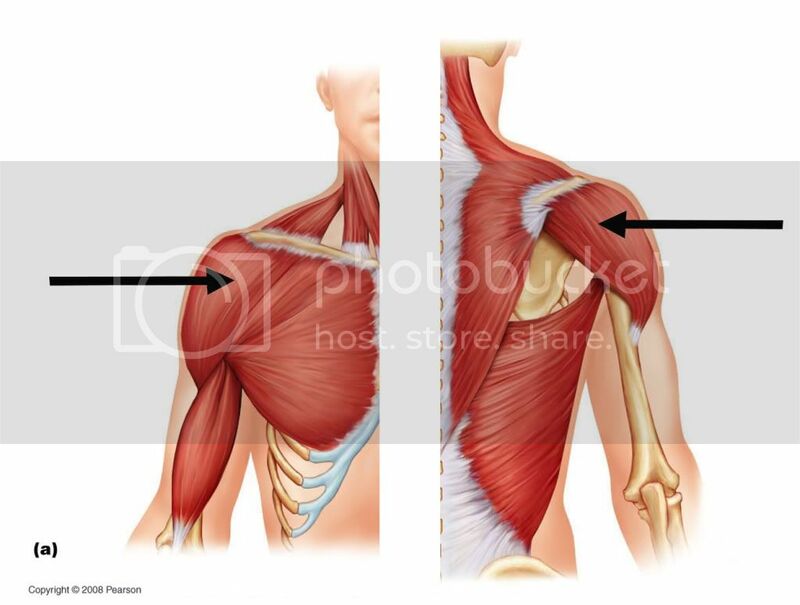 A: Flexion and adduction of arm; synergist of Pectoralis Major. O: Lateral epicondyle of humerus. I: Lateral aspect of olecranon process of ulna. 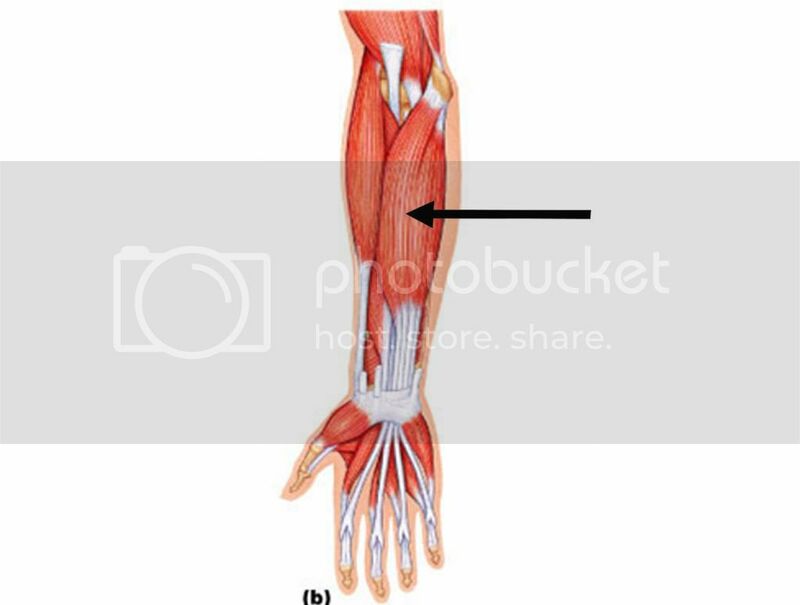 A: Abduction of ulna during forearm pronation; synergist of Triceps Brachii in elbow extension. Long head - Superior to glendoid cavity. I: Radial tuberosity of radius. 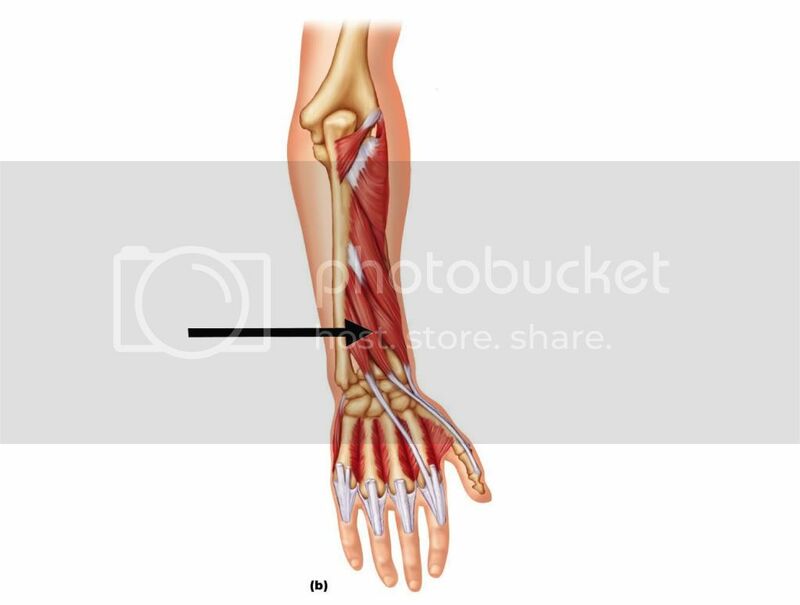 A: Flexion of elbow joint and assists in supination of forearm. Must be supinated in order to flex. 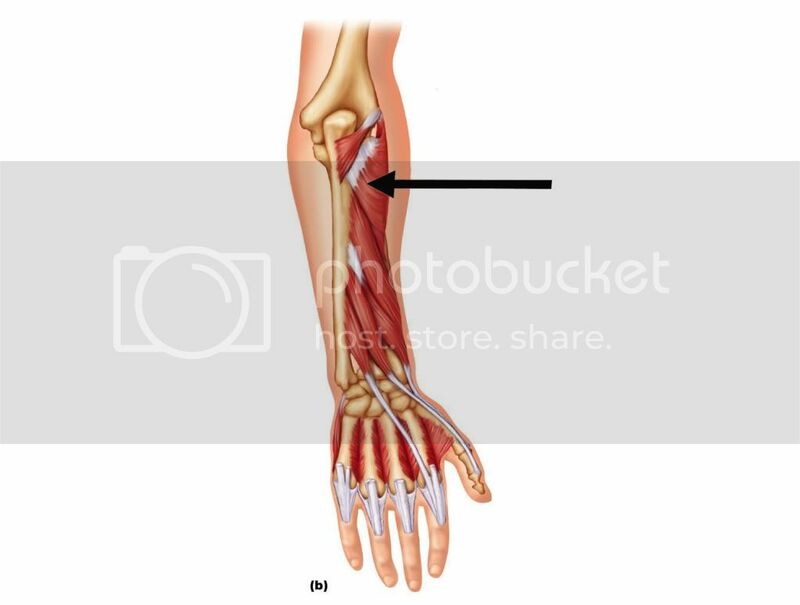 I: Coranoid process of ulna. 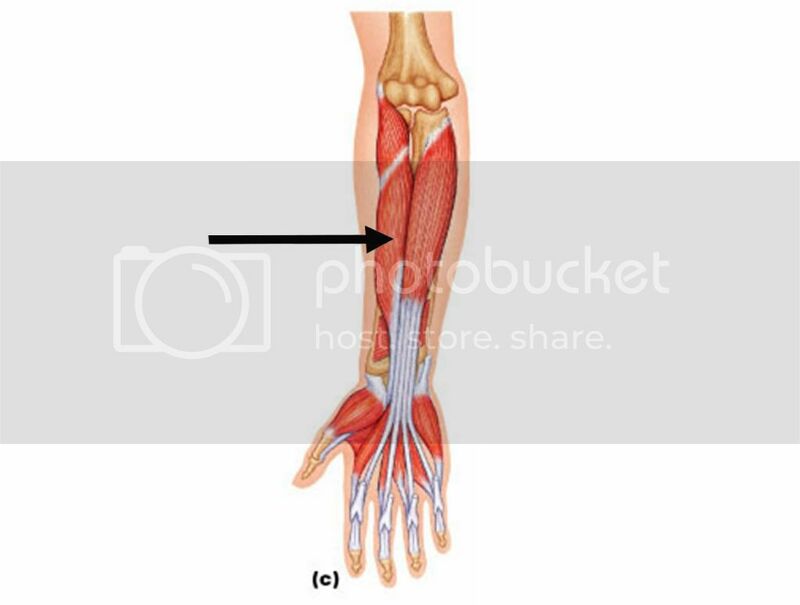 A: Flexion of forearm (PM). 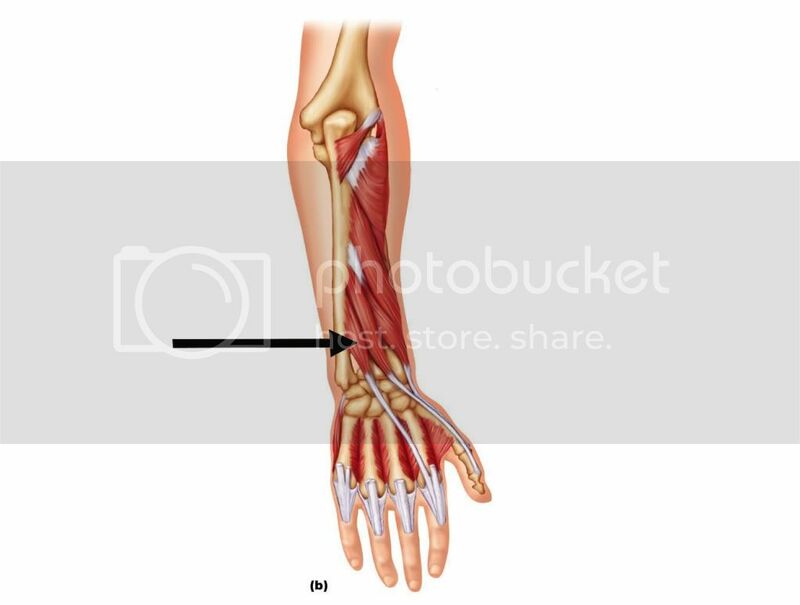 O: Distal end of humerus. I: Styloid process of radius. 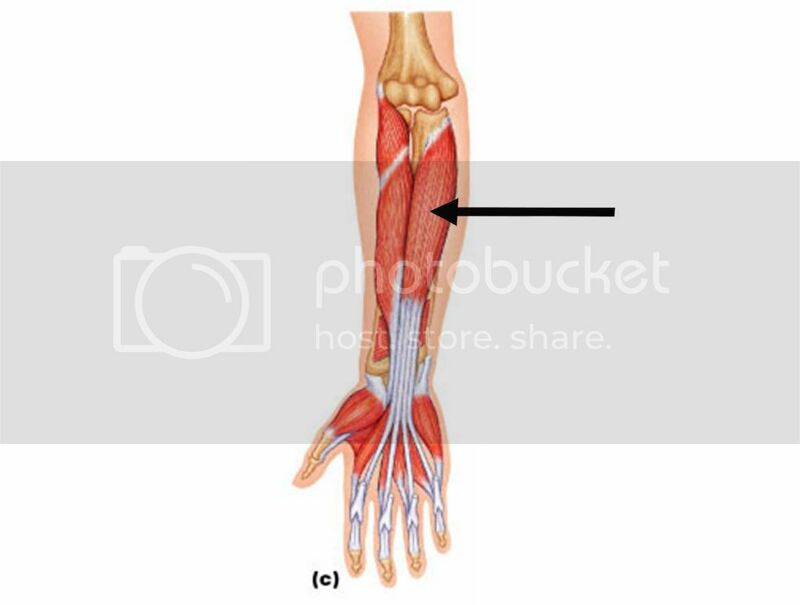 A: Synergist in forearm flexion; stabilizes elbow joint. O: Long head - Inferior to glenoid cavity. 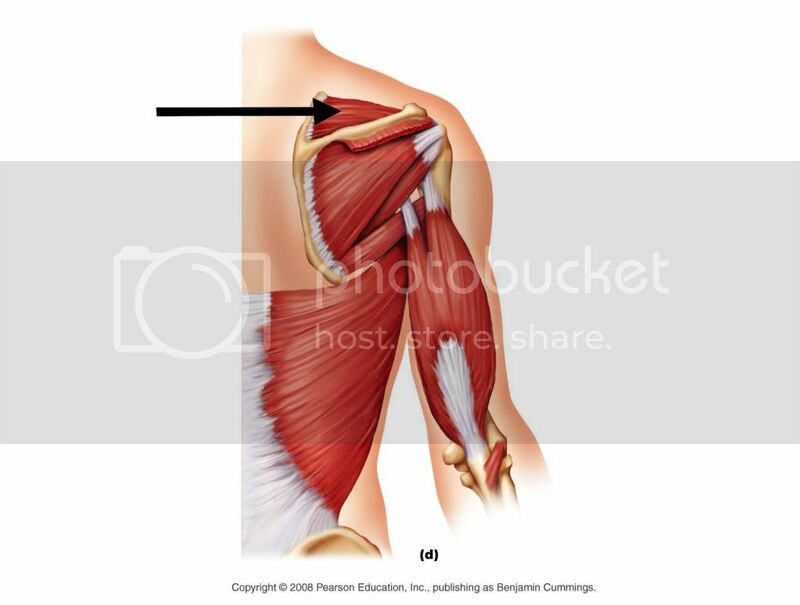 Medial head - Inferior half of posterior humeral shaft. Lateral head - Superior half of posterior humeral shaft. A: Extension of forearm (PM - medial head); antagonist to flexors of forearm; long and lateral heads active in extension against resistance. 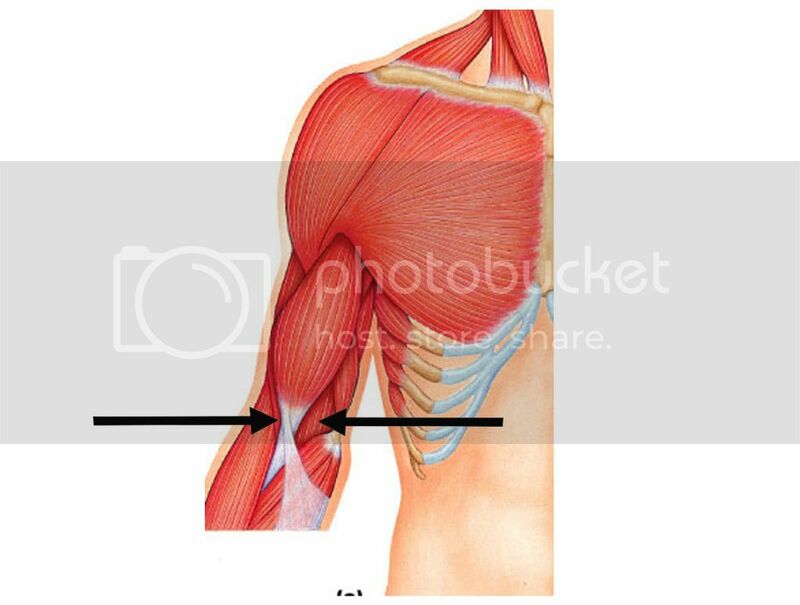 Weak flexion of elbow; synergist to Biceps Brachii. 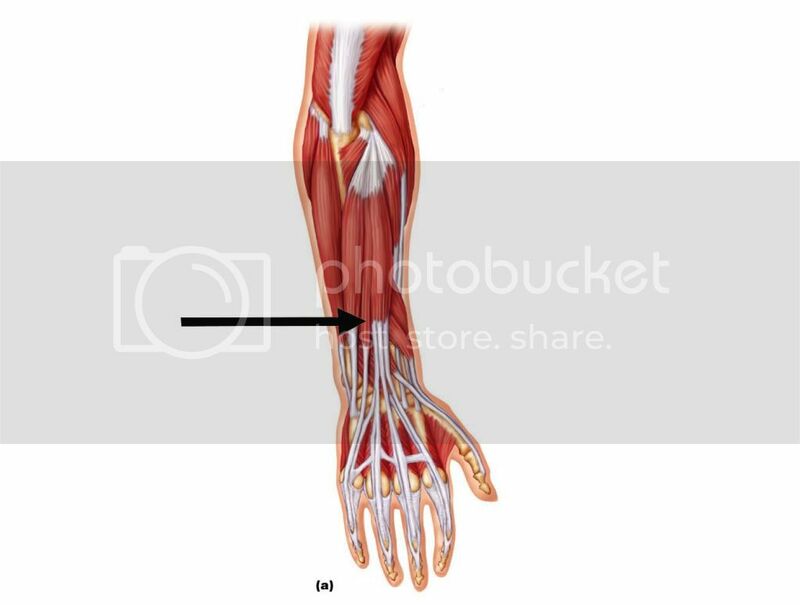 Superficial Anterior Forearm Common Origin: Medial epicondyle of humerus. Weak flexion of elbow; may assist in abduction. 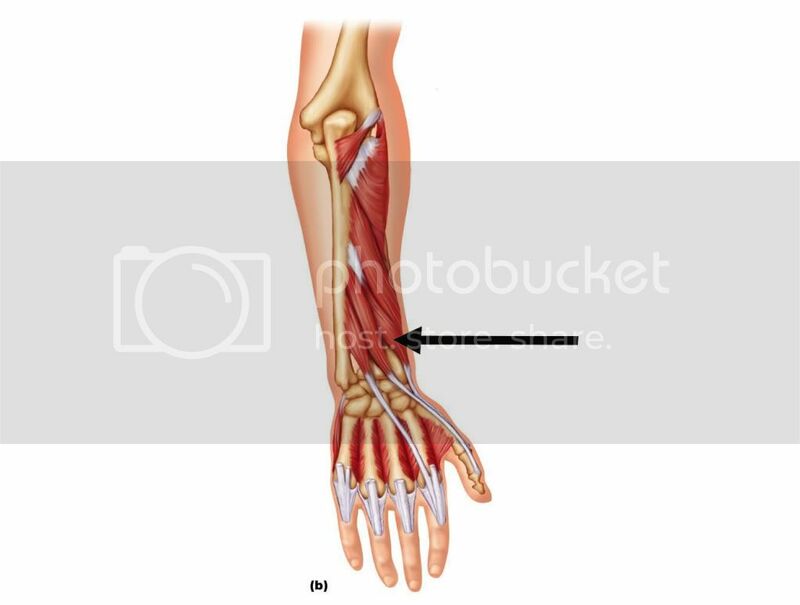 Actions: Flexion of wrist and fingers. Actions: Flexion of wrist and thumb. 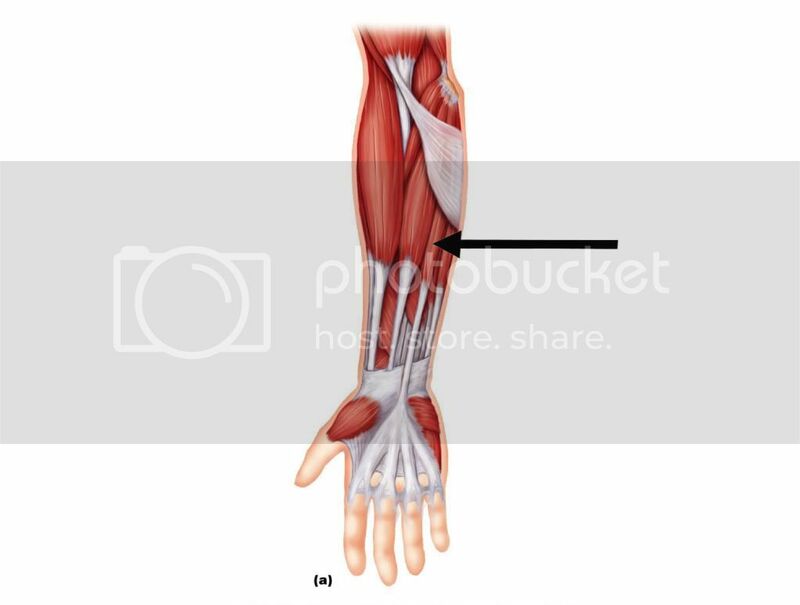 Actions: Extension of wrist; radial deviation. Superficial Posterior Forearm Common Origin: Lateral epicondyle of humerus. 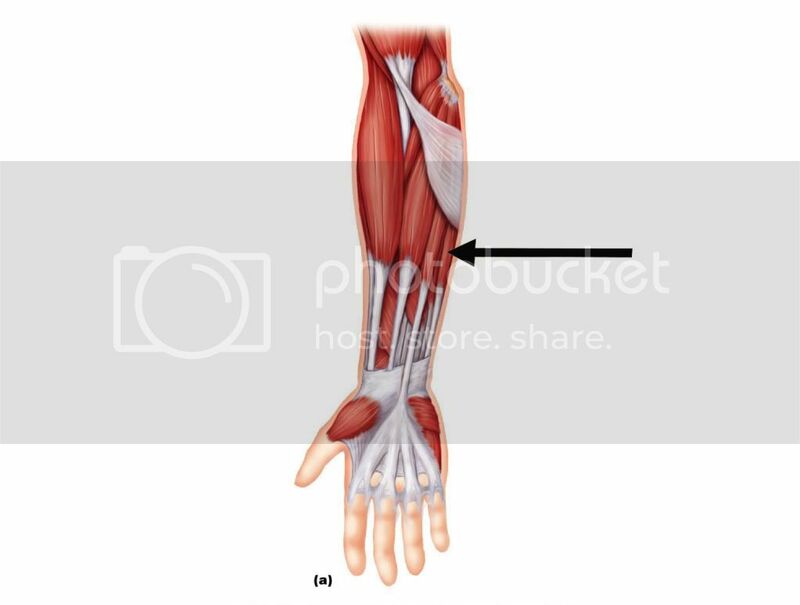 Actions: Extension of wrist; extension of digits (PM). 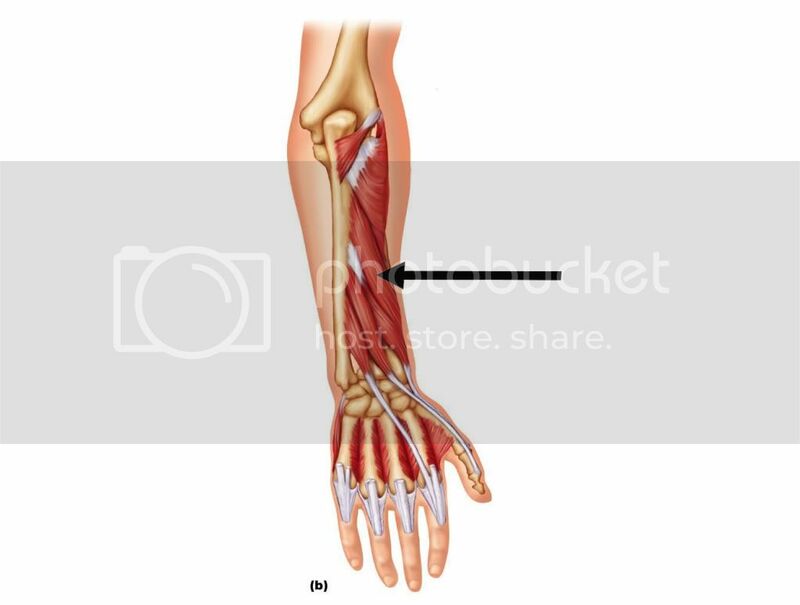 Actions: Extension of wrist; ulnar deviation. Actions: Extension of 5th digit. Actions: Abduction and extension of thumb. Actions: Extension of 2nd digit; assists in extension of wrist.